Far from being a quiet month I feel we have thrown ourselves into February with a vengeance!. This week the front of the studio was dug up and a big slab of concrete laid to create a new, larger deck area outside the double doors. Once we have landscaped around it all I hope it will form a natural extension to the studio in fine weather and it links neatly around to the veranda too – good job I can see the end picture in my head though when it’s windy and rainy and there are piles of dirt everywhere! Our resident pheasant, Philip, decided to take a stroll across the wet cement before it set so his presence has been preserved for posterity now! 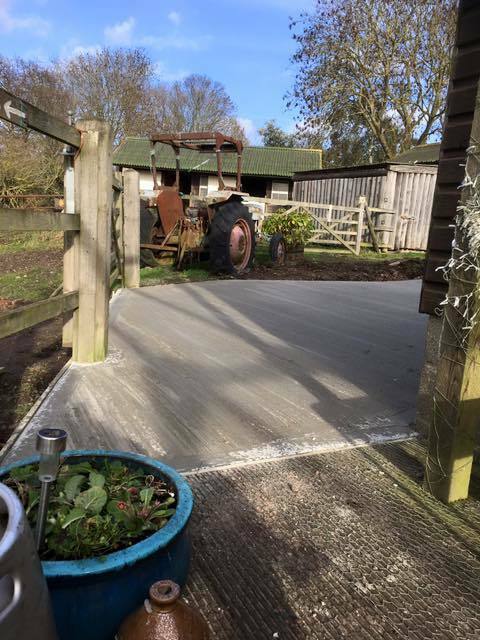 Another slab of concrete is being laid on the lower lawn – not the whole lawn I hasten to add, just for the floor of a new shed. Ultimately, I am hoping this will be my own personal work shed but it will double up as a kitchen shed for us to work from when we do afternoon teas in the marquee. Finally, the digger pulled out old tree stumps up by the house and I am now redesigning the terrace area outside our Garden Room. Don’t get excited, it’s nothing grand, just a stoned extension to what there is already. I am hoping to get a lot of plants I have in tubs and pots planted up either through the stones, or around the studio to cut down on the rather onerous amount of watering I have to do in the summer. As I said, we have not been idle this month and we are only a few days into it!!! Wishing you all the best for a healthy and very creative 2019! I hope we can help you with the creative side of things this year—all of our new and exciting courses are now on the website. You will see that as well as our very popular painting courses we have also included a few more craft events to appeal to a wider audience. The new brochure will be posted out this month so keep a look out for that too. 2018 was an exciting if slightly exhausting year! We were hit by bad weather and tutor illness in March and had to reschedule a couple of courses, but I think the tutors and students were happy to return in warmer times. The new marquee was a bit hit – a fabulous space and atmosphere for both craft workshops and our, now famous, afternoon farmhouse teas. We hosted some amazing events in the marquee (and studio) this summer and learned a lot in the process. We plan to put up a new shed to replace our kitchen tent that finally gave up the ghost after a very windy autumn. This will make life a lot easier and make us more efficient as well as providing extra storage and maybe somewhere to do some of my own painting and crafting too when not in use??? Who knows…..?? Our foray into craft workshops was also very popular and allowed new people who aren’t painters to get a taste of the ‘Watershed’ experience. We have had some very exciting and inspiring art courses last year – fabulous work was created, and new friends made too. Our wreath making workshops were the final events of the year and were more popular than ever – we had to put on an overflow night! I know these evenings signal the start of Christmas for so many people, so they are always joyous occasions. So, roll on 2019 – do have a look at the courses listed on the website – some completely new ones sit alongside favourites but even these are different each year so you won’t get bored. I do try to match the right people with the right courses so always ring or email to find out what would suit you best. Its actually raining and proper rain too! After record temperatures again this week it’s a bit of a relief, especially as we managed to get the last bit of wheat harvested this morning before the deluge began. Yesterday we had perfect weather for a wonderful wet felting course which Kris Marriott ran. We were able to use the marquee which was ideal with all the water involved and it meant we could feel like we were outdoors without actually being outdoors! I also had no idea quite how much physical effort was involved. So not only do you get to make a beautiful felt article but you also experience a full workout! Kris is very inspiring and encouraging and everyone enjoyed the relaxed and creative experience in our countryside location. It was a very happy day. There are some pictures on the Gallery Page. Just over a week before we had hosted a 75th birthday party for a local girl. It was a ladies only event and it was joyous. However, we had to make the decision to move from the marquee to the studio when the wind decided to really get lively as the morning progressed. We are very lucky to be able to have this option and it worked very well. Whilst it was harder for us because we had lost the larger kitchen space it didn’t matter – everyone had a wonderful time and were relieved to not have to sit for ages being blown to bits, and I was relieved the glass and crockery remained in tact. We have another tea coming up this weekend and fortunately the weather appears fine…fingers crossed! Despite not having rain for ten weeks now it’s been perfect weather for a variety of garden events and parties over the last few weeks. Today we have a yoga retreat taking place here and it’s wonderful that everyone can enjoy just being outside! They even used the tree house - so much energy flowing around the whole place tonight! Tomorrow we have one of our granddaughter's birthday parties so a bouncy castle will be in full bounce on lawn I dare say! The poor garden has taken a bashing from the lack of rain but the numerous tubs continue to flourish with love and attention! I'm beginning to get slightly bored with watering I confess as I have over 120 pots, of all shapes and sizes, to find and drench every couple of days. The Tendring Hundred Farmers Club annual show was a huge success. Once again I organised the Art Show with the help a very good team of people. We had a record number of paintings and a large footfall and attracted a good deal of praise and comment but sadly sales were down on last year. Maybe it was the heat? Kris Marriott—Wet Felting Workshop—Wed 7th August, £75 including all materials and a delicious farmhouse lunch of course—something exciting and different and one of our marquee workshops. Click on this text to edit it. A big thank you again for everyone who has replied to the GDPR emails—I think we are all thoroughly sick of that subject now, me included. This spring was eventful—some amazing courses but also a few cancellations due to weather and tutor illness etc but it was lovely to finally host busy, creative and happy days here after that oh so long cold winter. Looking forward to the summer and you can see the tents have just gone up! They have already been in used, firstly for a beautiful memorial service and on Monday we hosted a very successful year group visit from the local primary school with historical and art based activities. This weekend we have a Clarinet workshop in the studio plus on Sunday about sixty people will be joining us for a garden party and the weather so far, fingers crossed, looks good! Tendring Show—Saturday 14th July. Do come and see me in the Art and Lifestyle Marquee where I shall be most of the day as I run the Art Show. Trevor Osborne will be demonstrating hare sculpting and Alison Burchert her amazing pastel techniques! www.tendringshow.co.uk—a really brilliant day out for all the family! Wishing you all a very Happy Easter from Watershed Studio! Important Notice re GDPR (general data protection regulation act). I know, it’s maybe not something you all feel you want or need to understand, however I am now required to ensure that everyone I mail or email with newsletters, brochures, or other promotional material is happy to receive them. Please, please, if this is something you wish me to continue to do can you email me to that effect. This includes people already booked on courses this year! THANK YOU. The snow has finally gone, hopefully for good, and we have finally started back with some fabulous courses already this month. We have a busy spring ahead of us but luckily, for those of you wishing to reboot, or enhance your artistic skills and techniques, we have some spaces still free—details below! Spring is coming—honest! After a winter of hard work redecorating the studio we are looking forward to welcoming students back when courses resume next month. The first two are full but we fortunately still have spaces left on others to offer. Please do see the NEW WEBSITE for more details. Studio Refurbishment We are busy renovating and redecorating the studio before it’s first event of 2018 – The Pudding Club Lunch on February 18th.in aid of Essex and Herts Air Ambulance. We think you’ll notice the difference! Studio Refurbishment Many people think we have the winter off before courses start again in March– I wish! The builders, despite the weather, have already replaced studio roof and undertaken internal renovations. After Christmas we carry on with decorating and generally sprucing up and re-vitalising the place. We feel that after eighteen years of hard service it deserves some serious TLC - I do hope regulars notice the difference!